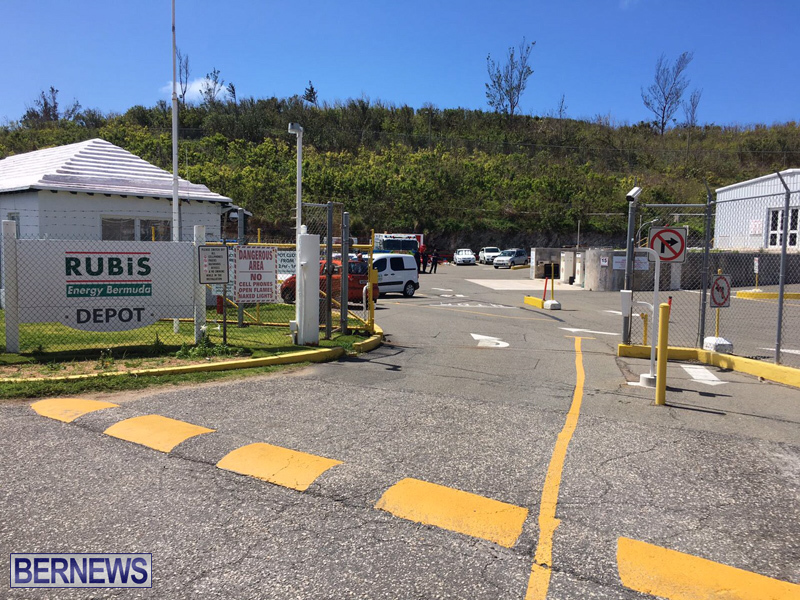 The Department of Environment and Natural Resources [DENR] provided an update on the gas spill that occurred Rubis facility in Ferry Reach on 27th March. A Government spokesperson said, “”As of the latest data received by Government on Monday 10th April a vapour plume [i.e. fumes above the water table] has been detected in all of the four new wells recently drilled to the south of the spill, near the southern RUBIS property boundary. “Liquid gasoline product has not been detected at three of the new wells and a slight sheen was detected at one new well to the south-west of the spill location. Furthermore neither liquid product nor vapour product has been detected at the two private wells to the south of Ferry Reach Road. “These private wells will continue to be monitored by RUBIS at a rate of 2-3 times each day. The Department has contacted neighbours to the south to let them know if they were to smell any chemical fumes to notify the Department immediately. “RUBIS will continue to monitor these wells surrounding the spill and will consider putting additional wells in to fill in the missing areas and if the liquid product spreads then this will necessitate the drilling of new wells to ensure that the full extent of the liquid spill is always understood. “RUBIS has already made a start to remove the gasoline from the ground from an existing small-diameter monitoring well using a vacuum truck. Additional specialists are en-route to Bermuda to drill larger-diameter recovery wells in the centre of the spill that will provide a greater recovery rate of the gasoline once additional equipment has arrived. “Additional equipment to address the vapour plume using soil vapour extraction is also being set up. The recovery of the liquid product will be followed by recovery of the vapour phase of the gasoline and the monitoring will continue [i.e. liquid product thickness, well headspace, and dissolved constituents in the groundwater] to the standards that are set in Bermuda’s Risk Based Corrective Action [RBCA] Guidelines. “Under these guidelines the recovered product and associated water must be properly disposed of at the Government Hazardous Waste Facility or via other approved methods. “For information the estimated 73,000 litres [i.e. 19,300 US Gallons] of gasoline liquid percolated down through approximately 14 metres [i.e. 45 feet] of limestone before reaching the groundwater where it was expected to float as a lens on top of the groundwater and spread out laterally. “In addition to the liquid gasoline floating on the water table and spreading out laterally the fumes from the gasoline are also expected to spread out in the porous limestone above the liquid plume and water table. These fumes are referred to as the vapour plume and this is expected to travel ahead of the liquid gasline plume. “In summary, the Department of Environment and Natural Resources considers that the full extent of the liquid gasoline plume that is floating on the groundwater is understood and is contained fully on the RUBIS site. “However, the vapour plume of fumes above the water table has extended to the four recently drilled wells with one of the wells also exhibiting a slight sheen. The recovery of the liquid product has started and will increase once further specialist equipment and personnel arrive on site. No, it’s as bad as has been reported. People with the expertise and equipment to hasten recovery only reduces the risk of the spill spreading further underground. March 28th:“RUBIS employees have been trained in how to deal with such an emergency and are already working on containment, in conjunction with the Department of Environment and Natural Resources pollution control team. Not good Rubis…not good. Whoever was inspecting your valves over the years should be let go immediately. Slacking! shows you know jack s**t of which you speak from various levels. are you an expert??? How long did this leak go on for before it was discovered? After it was discovered how long did it take to stop?? To put their leakage estimates in perspective, some back of the envelope calculations indicate that the amount of gasoline that percolated into the ground is approximately equal to an average size swimming pool (16x32x5ft) at full capacity. This would be enough gasoline to fill up an average car about 1,500 times.